If you've encountered a medical "patch", it may well have been a nicotine patch. They slow-release nicotine into your body through the skin, and numerous clinical trials have shown they are better than a placebo at helping smokers to quit. There's a lot more to patches than smoking cessation, though. Parkinson's, Alzheimer's, B12 deficiency, hypertension and motion sickness are just some of the conditions that can be treated with one of these transdermal therapeutic systems (TTS) patches. And now they're going "smart". Some of tech's big names are involved. The likes of Qualcomm, Samsung and E Ink, maker of the screens of Amazon Kindle ebook readers, are all working on tech-infused versions of what might be considered the evolution of the salves and poultices used in Ancient Egypt. So how far away are we from seeing what smart patches have to offer the world of health monitoring? Here's what we know so far. The E Ink display used in the LTS patches isn't quite the same as that of a Kindle ebook reader instead using a new low voltage e-paper display. This is flexible and thinner than traditional e-paper designs making it suitable for use on a skin-worn patch. These optimisations aside, the core benefit of E Ink is that it's a "bi-stable" display: while changing what's on-screen uses power, retaining an image doesn't. Even if the battery runs out, the patch's E Ink panel will still be able to show the "change me" prompt. A traditional LCD panel wouldn't. In July 2016, E Ink started working with LTS, a German company that makes traditional patches for smoking cessation and other medical uses. The project was officially announced in October 2017, and LTS has already mapped out what a prototype may look like. It's a 2-inch square with a coin-shaped battery, a micro-controller and E Ink screen embedded in the patch itself. It will weigh just 5g. "The primary benefit is to improve patient adherence," says Dr. Paul Apen, E Ink's chief strategy officer. A smartwatch comparison is apt here. If you want to monitor your heart rate 24/7 with a wearable, and many can these days, you're not going to get results unless the band is tight enough and the battery charged. Similarly, patches are easy to fit improperly and some last as little as a day, with no feedback when they expire. Dr. Apen says the E Ink display of the patch will prompt the patient with "messages to ensure that the patch is applied correctly, and to remove the patch, and replace with a new one, when the designated time period has passed to ensure the medication is administered without interruption." The LTS design uses a pressure sensor to judge whether the patch is sitting on the skin correctly. These may seem like low-level smarts, but they stop the wearer from having to be so mindful about the use of a patch. It is designed to help reduce the effects of human error and carelessness. E Ink is no stranger to the medical field either. In 2015 it announced its collaboration with Palladio Group, called PhutureMed. It is smart packaging that uses an e-paper display to monitor when a medication was last used and whether it is stored at the right temperature. Even boxes are smart in the world of big pharma. 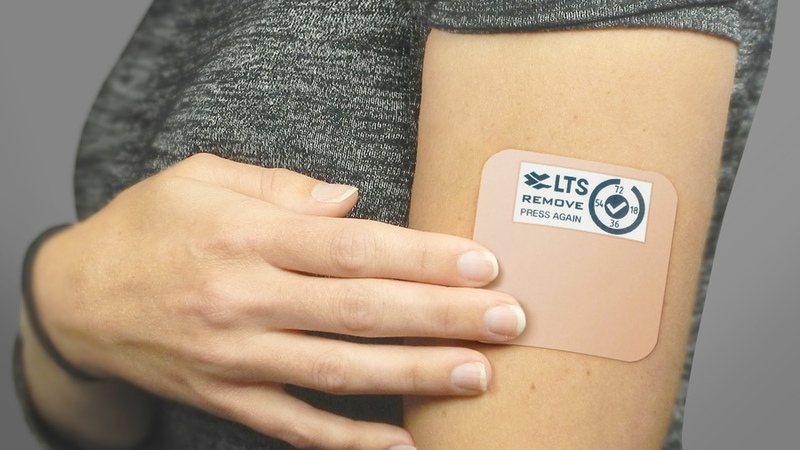 LTS has bigger plans for its smart patches too. Head of marketing and market services Dr. Iris Schnitzler showed us future concept designs that incorporate Bluetooth for connection to a smartphone app, opening up potential for other diagnostics like heart rate monitoring. The LTS and E Ink partnership is a young one, though, and Schnitzler says "regulatory issues have to be solved first" and that a real "smart patch" product by LTS won't be on the market for the next 5 years. Qualcomm's smart patch project is much closer to reality. Its medical arm, Qualcomm Life, already has reference models in "clinical validation" testing. Qualcomm Life president Rick Valencia tells us "we expect the patches to be FDA cleared and CE marked by the end of 2018," meaning they will be ready for use in the US and EU. The Qualcomm approach is a little different to LTS's, though. Rather than focusing on delivering medication through the skin, "the patches measure a variety of biometric parameters, including temperature, heart rate as well as measures of motion and gait," says Valencia. This would require almost the full gamut of sensors we see in consumer wearables (aside from GPS), miniaturised into patch form. They are designed for use with a huge variety of conditions. Qualcomm Life detailed 17 to us, including epilepsy, multiple sclerosis, major depressive disorders and heart failure. The patch records diagnostic data as you go about your day, and your doctor can monitor it without a need for expensive equipment, or potentially even a face-to-face appointment. The plan is not to simply release a series of Qualcomm-branded patches. Just as it has done with wearable tech hardware platforms like the Wear 2100 processor, Qualcomm will offer tried and tested integrated components that allow health tech companies to develop patches more easily. These will become part of Qualcomm's 2net platform, which is a cloud-based infrastructure for monitoring of patients. As such, there is no single vision of what a Qualcomm-powered smart patch will look like or behave. However, Valencia did tell us a little about the reference designs currently in testing. "Our first generation of patches are currently in the validation stage and look like small oval band aids," says Valencia. "They have a multi-day wear time, can withstand showers and sweat, and are designed to be comfortable to wear; however, they are not submersible." As long as you don't have a bath or go swimming, you can just pop one on and forget it's there for a few days. He also says the patches use "coin-sized batteries similar to those in the 2032 and 2016 class." They are similar to the kind used in low-tech pedometers and bank card readers, although the Qualcomm patches are "single use". In other words, they're disposable. These reference designs don't use a specific processor, able to use several different types, but Valencia does say the hardware is comparable to chipsets used in other wearables. At this early stage, Qualcomm Life wasn't able to tell us what the current trials involve either. Are they being used by asthma sufferers? People recently discharged from hospital? Or are they simply being used by normal people with no specific medical condition? Certain parts of the Qualcomm smart patch plan are vague, as you might expect from one of the biggest names in tech. Qualcomm and E Ink are not alone in showing an enthusiasm for the concept of building smart patches. The other biggest player, in the tech world at least, is Samsung. Its S-Patch 3 popped up in an FCC listing in the summer after the first S Patch was announced on stage at CES 2016. From what we can see, the Bluetooth connected S-Patch 3 will be built to continuously monitor heart rate (to ECG standard), skin temperature, galvanic skin response and body fat data. Elsewhere, there's promise in connected health patches from names like Lief Therapeutics, a HAX Accelerator startup which is working on a bio-sensing patch worn on the chest. This is more of a wellness device - the Lief patch monitors your heart rate and breathing and then helps you to control them with rhythmic vibrations. The form is going in all sorts of directions. Researchers at Binghamton University in New York have recently developed a paper based patch which can deliver glucose monitoring to diabetics, too. And the iRhythm Zio XT packs heart rate monitoring sensors and a battery unit into a wire free, water resistant patch which has a button so users can time stamp anything unusual. However, when many of the smart patches we see, such as Lief, are typical small operations relying on crowdfunding or start-up style venture capital, it's reassuring to see patch projects that aim to inform primary healthcare in a much wider way.